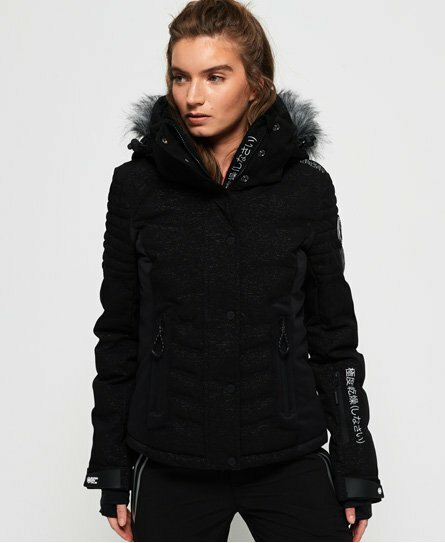 Superdry women’s Luxe snow puffer jacket. Designed for the slopes, this ski jacket features a detachable hood and faux fur trim as well as bungee cord adjusters. This snow jacket benefits from a total of three external zip pockets, including one on the left sleeve, and an internal pocket. This jacket also has earphone cable routing, a super soft lining and thumbholes on the cuffs as well as a hook and loop fastening, a popper snow skirt and a bungee cord fastening on the hem. This ski jacket is finished off with Superdry branding on the arm, shoulder and two Superdry logo badges on the sleeve.